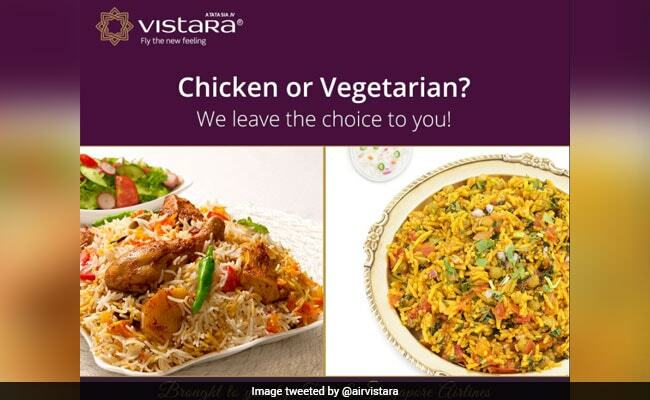 Did Vistara Just Troll Air India For Its New Veg-Only Policy? On Monday, Air India said it took a "conscious decision" to serve only vegetarian food to passengers flying economy on domestic flights in an effort to "reduce wastage, reduce cost and improve catering service." New Delhi: Vegetarian or non-vegetarian, this airlines wants you to know that the choice of in-flight meal is up to the passenger. Vistara, a joint venture between Tata Sons and Singapore Airlines, posted a well-timed ad on Facebook and Twitter a day after Air India announced it would serve only vegetarian meals to economy passengers on its domestic flights. "Chicken or Vegetarian?" asks Vistara in the ad, "We leave the choice to you!" On Twitter, the ad has been retweeted over 260 times since being shared approximately 16 hours ago. Tweeting a person asking whether the ad was in response to Air India's much-talked about move, Vistara's Chief Strategy and Commercial Officer Sanjiv Kapoor responded cheekily with this message and smiley face emoji. On Monday, Air India said it took a "conscious decision" to serve only vegetarian food to passengers flying economy on domestic flights in an effort to "reduce wastage, reduce cost and improve catering service." This decision is not applicable to those passengers travelling business class.